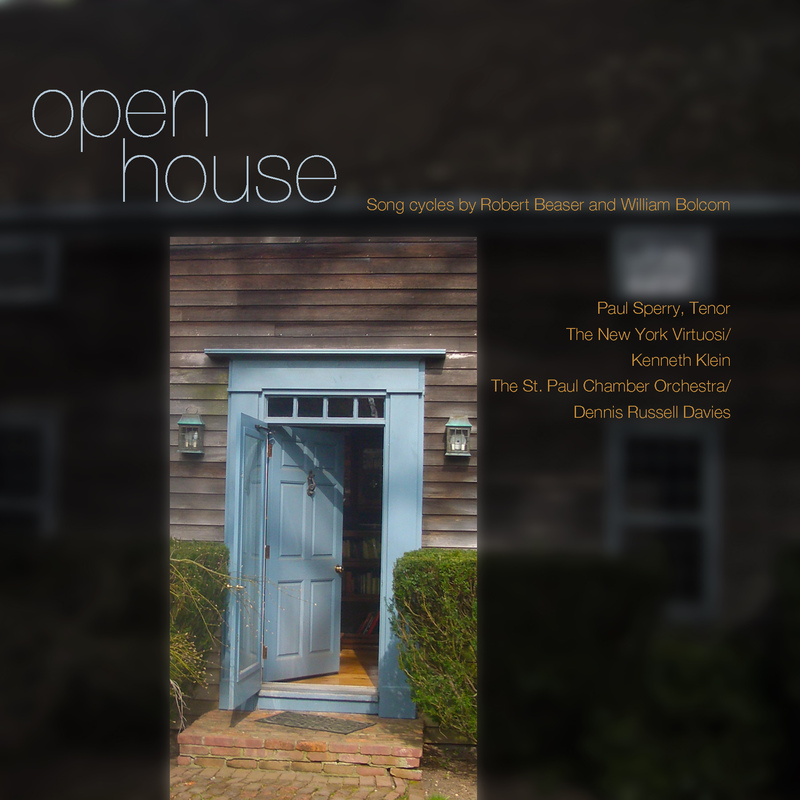 The pair of monumental song cycles for tenor and chamber ensemble that comprise the new CD Open House in many ways represent a culmination of 20th century American art song. Written for lyrical tenor and longtime champion of new work Paul Sperry, the songs by William Bolcom and Robert Beaser combine poetry and music to create a heady mixture that brims with refinement and craft. Sperry is at home in a repertoire that extends from Monteverdi opera and Bach Passions to Britten’s “Nocturne” and hundreds of songs in more than a dozen languages, but it is to American music that he has brought a conviction and enthusiasm that has breathed life into it for countless listeners. Composer William Bolcom, a member of Theodore Roethke’s poetry-writing class at the University of Washington in the mid-‘50s, has since written, “I did not study with him with any ambition to become a practicing poet, only to try to learn how to set words to music.” After studying composition with Darius Milhaud in California and Paris, he received the first Doctor of Musical Arts degree from Stanford University. He has since received two Guggenheim fellowships, a Koussevitzky Foundation grant, an American Academy of Arts and Letters award, and a National Medal of Arts, as well as the Pulitzer Prize for 12 New Etudes for Piano. Robert Beaser has emerged as one of the most accomplished creative musicians of his generation. Since 1982, when the New York Times wrote that he possessed a “lyrical gift comparable to that of the late Samuel Barber,” his music has won international acclaim for its balance between dramatic sweep and architectural clarity. He is often cited as an important figure among the “New Tonalists,” composers who are adopting new tonal grammar to their own uses, and through a wide range of media has established his own language as a synthesis of Western tradition and American vernacular. “Every time I sang ‘Songs from the Occasions,’” says Sperry, “I was amazed by the way Bob managed to make seven instruments sound like an orchestra. Sometimes, in rehearsals, I was so captivated by what they were playing I would forget to come in. I always had a soft spot in my heart for Motet XVI because I knew it was the closest I would ever come to singing Tosca. "[Open House] is engaging and employs a wide range of compositional expression. … Sperry has been a champion of contemporary music, and he sings these works well. His diction is clear and his light lyric voice has a penetrating quality."